Larry Tetone, Larry Friedman, and Melissa Osborne, and collaborators from the Gelles lab (Brandeis University) and the Landick lab (University of Wisconsin-Madison) used multi-wavelength single-molecule fluorescence methods to for the first time directly observe the dynamic binding and dissociation of an accessory protein with an RNAP during active transcript elongation. Their findings are detailed in the recent paper “Dynamics of GreB-RNA polymerase interaction.” (PNAS, published online 1/30/2017). Seen at the Gelles Lab Little Engine Shop blog this week, commentary on a new paper in Nature Communications, published in collaboration with the Goode Lab and researchers from New England Biolabs. Regulation of actin filament length is a central process by which eukaryotic cells control the shape, architecture, and dynamics of their actin networks. This regulation plays a fundamental role in cell motility, morphogenesis, and a host of processes specific to particular cell types. This paper by recently graduated [Biophysics and Structural Biology] Ph.D. student Jeffrey Bombardier and collaborators resolves the long-standing mystery of how formins and capping protein work in concert and antagonistically to control actin filament length. Bombardier used the CoSMoS multi-wavelength single-molecule fluorescence microscopy technique to to discover and characterize a novel tripartite complex formed by a formin, capping protein, and the actin filament barbed end. Quantitative analysis of the kinetic mechanism showed that this complex is the essential intermediate and decision point in converting a growing formin-bound filament into a static capping protein-bound filament, and the reverse. Interestingly, the authors show that “mDia1 displaced from the barbed end by CP can randomly slide along the filament and later return to the barbed end to re-form the complex.” The results define the essential features of the molecular mechanism of filament length regulation by formin and capping protein; this mechanism predicts several new ways by which cells are likely to couple upstream regulatory inputs to filament length control. 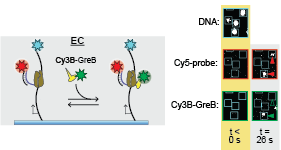 The capping protein expression plasmid described in this article is available from Addgene. Readers interested in this subject should also see a related article by Shekhar et al published simultaneously in the same journal. We are grateful to the authors of that article for coordinating submission so that the two articles were published together. Three of five Guimette Academic Achievement Awards were recently given to Division of Science sophomores, according to Meredith Monaghan, Academic Services. Each award is worth $5000 per semester for the remaining four terms of study. In order to qualify for consideration, applicants must be sophomores with at least a 3.50 GPA who are not already receiving other merit awards. All 2015 recipients have been named to the Dean’s list in every semester. The Giumette Academic Achievement Award began in the 2004-05 academic year to recognize currently enrolled sophomores who have distinguished themselves by their outstanding scholarship and academic achievements at Brandeis. The Academic Achievement Awards have been re-named after Peter Giumette, in honor of his twenty years of service to Brandeis as the head of Student Financial Services. Zoe Brown ’17 is double majoring in Neuroscience and Psychology and has worked as a research assistant in Professor Arthur Wingfield’s Memory and Cognition Lab. This experience led Zoe to an internship at McLean hospital, where she works in the Bipolar and Schizophrenia division. Zoe will be a Bauer Foundation Summer Undergraduate Research Fellow in the Wingfield lab this summer. After graduating from Brandeis, Zoe plans to enter a Ph.D. program in either neuroscience or psychology and hopes to work in clinical neuropsychology, research, or teaching. Kahlil Oppenheimer ’17 is double majoring in Computer Science and Mathematics. He serves as both a Teaching Assistant and an Undergraduate Department Representative for the Computer Science department. He has worked as an intern for both Draper Laboratories and HP Vertica, where he has utilized his academic knowledge in a real-world setting. Kahlil will be a software engineering intern at Kayak this summer and hopes to continue to explore both applied and abstract mathematics. Leah Shapiro ’17 is majoring in both Biological Physics and Mathematics. Leah has been conducting independent research with Professors Jané Kondev (Physics) and Jeff Gelles (Biochemistry), on an interdisciplinary project investigating gene regulation and expression. This summer Leah will be participating in research at the Yang Laboratory at the University of Michigan. To u tilize the information contained within a cell’s genes, the enzyme RNA polymerase must find the beginning of each gene (the promoter). Finding the beginning is a prodigious task: RNAP must start at a particular base pair of DNA, but the cell contains millions of base pairs to choose from. It has been proposed that gene-finding challenge is aided by a process termed ‘facilitated diffusion’ (FD). In FD, RNA polymerase first binds to a random position on DNA and then slides along the DNA like a bead on a string until it encounters the target DNA sequence. 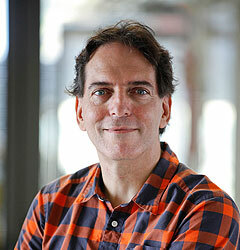 In a recently published study in PNAS (1), biophysicists Larry Friedman and Jeffrey Mumm worked with Prof. Jeff Gelles in the Brandeis Biochemistry department to test key predictions of the FD model. They used a novel light microscope that Friedman and colleagues invented and built at Brandeis, a microscope that can directly observe the binding of an individual RNA polymerase to a single DNA. The scientists studied the σ54 RNA polymerase holoenzyme, an RNA polymerase found in most species of bacteria. Surprisingly, none of the three predictions of the FD model that the experiments tested were found to be valid, demonstrating that target finding by the polymerase is not accelerated by sliding along DNA. Friedman and colleagues instead propose that RNA polymerases are present in such large numbers that they can diffuse through the cell and efficiently bind to their target sites directly. The absence of FD may explain how other proteins can bind to positions on the DNA that flank gene start sites and yet not interfere with RNA polymerase finding the gene. 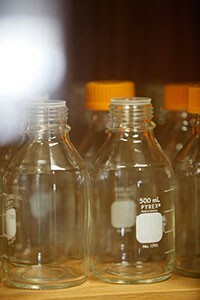 Cells contain thousands of protein “micromachines” performing a bewildering number of chemical reactions every second. The challenge for biologists in the 21st century is to integrate information about multiple – or even all – proteins into holistic models for the entire cell. This is a daunting task. The addition of any new component to a system can alter the behavior of the components already there. This phenomenon is especially familiar to biologists studying the cytoskeleton, a complex system of protein filaments that provide the force for cell division and migration, among other things. The building blocks of the cytoskeleton are simple proteins called tubulin and actin that assemble into a remarkable variety of shapes depending on context. While the basic chemistry of this assembly process has been understood in purified systems for decades, how it happens in cells is not well understood. For example, growth of actin filaments is a two-step process: nucleation, or the formation of a new filament, and elongation, or the extension of that existing filament. Both steps happen just fine when actin is present in pure form in a test tube. In cells, however, proteins called profilin and capping protein block these two steps, respectively. Nucleation and elongation can only occur because other proteins overcome these blocks. Thus, a faithful experimental system to study actin assembly as it would occur in a living cell requires – at a minimum – five purified proteins. One technological advance of great importance is the ability to literally see single molecules (in this case proteins) using advanced fluorescence imaging. In such an experimental system, many details can be captured. In a recent publication in Science, Dr. Dennis Breitsprecher and colleagues in the Goode and Gelles labs, undertook this challenge and directly visualized the effects of key regulatory proteins helping actin proteins nucleate and grow into filaments in the presence of both profilin and capping protein. A previous study from the Goode lab had shown that two proteins, called APC and mDia1, together stimulate the growth of actin into filaments (Okada et al, 2010). In the present study, Breitsprecher and colleagues examined the mechanism by which APC and mDia1 overcome the profilin and capping protein-imposed blocks. To do this, they ‘tagged’ actin, APC and mDia1 with three different fluorescent dyes, each of a different color, and then filmed these molecules (using triple-color TIRF microscopy) in the act of building an actin filament to learn precisely what they are doing. The authors began by imaging APC and actin (2 colors) at the same time. APC formed discrete spots on the microscope slide, and growing actin filaments emerged from them, suggesting than APC nucleates actin filament formation. As the filament emerged from the APC spot, APC stayed where it was: remaining stably associated at the site of nucleation. Next, the authors added dye-labeled mDia1 to the system, and observed mDia1 molecules staying attached to and ‘riding’ the fast-growing end of actin filament, while protecting it from capping protein. The most remarkable result came when they visualized all three labeled molecules together (actin, APC, and mDia1). What they saw was that APC and mDia1 first come together in a stable complex even before actin arrives. Then APC recruits multiple actin subunits to initiate the nucleation of a filament. This complex was resistant to the blocks imposed by both profilin and capping protein. As the filament grew from the APC-mDia1 spot, mDia1 separated from APC and stayed bound to the growing end of the filament – protecting it from capping protein while it grows. Thus, even though APC and mDia1 have different activities, participating in different stages of the growth of a filament, they associate together before actin even arrives, likely so that once the actin filament is born, it is immediately protected from capping protein. This mechanism has been compared to a rocket launcher: APC is the launch pad for an actin filament, which is then propelled forward by mDia1. Rocket launcher mechanism for APC and mDia1 nucleation. Left: Microscopic image of a growing actin filament. APC stays put while mDia1 remains associated with the fast growing end. Right: Model for the rocket launcher mechanism. 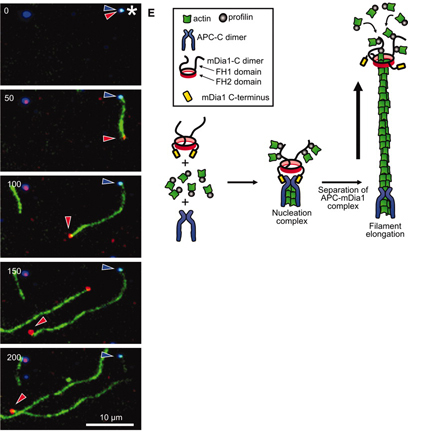 The new study provides great detail of the system: for example, the number of APC subunits required to nucleate actin filaments was determined, and the growth rate of actin filaments in the presence and absence of all the other components was measured. Ultimately, all of these data will be required to put together a detailed model of how actin filaments grow inside of real cells: details that would be difficult or impossible to obtain without employing single molecule analysis. For the future, the authors have set their sights on even more challenging experiments aimed at elucidating the mysterious link between tubulin and actin fibers. APC and mDia1 are implicated in this linkage in living cells, but almost nothing is known about how they physically link and/or communicate information between the two systems. Since APC is mutated in some 80% of colon cancer tumors, understanding its multiple roles is of clinical as well as intellectual importance. This will be an exciting, if challenging, endeavor for the future.